The city does not spend enough on pedestrian safety to keep up with its needs, and the outlook for more money in years to come is not optimistic, according to a city memo. It has city department heads proposing alternative solutions, including one that could require a change to the city charter. CINCINNATI — The city does not spend enough on pedestrian safety to keep up with its needs, and the outlook for more money in years to come is not optimistic, according to a city memo. It has city department heads proposing alternative solutions, including one that could require a change to the city charter. "(T)here is not enough funding to take on all pedestrian safety needs using traditional engineering and traffic-calming strategies," wrote Department of Transportation and Engineering Director Joe Vogel, in a Jan. 22 memo to City Manager Patrick Duhaney. As part of the last two city budget cycles, City Council approved $500,000 each year toward a Pedestrian Safety Fund. 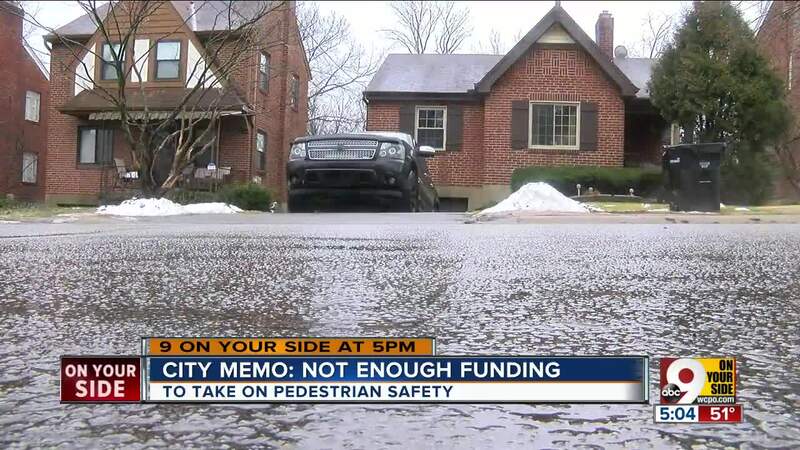 Duhaney described pedestrian safety as a "top priority" in his cover letter introducing Vogel's memo and another from Cincinnati Police Chief Col. Eliot Isaac. "However, combined with the myriad of other safety and priority needs of the city, it is very difficult to allocate all the resources needed to address this issue in totality given the operating and capital budget constraints faced by the city," Duhaney wrote. Vogel's memo goes on to outline what sorts of community-requested street upgrades that fund has provided, including 83 projects in 2018, as well as other capital projects that provide infrastructure for people walking city sidewalks, including the Street Rehabilitation Program, the Sidewalk Safety Program, the Hillside Rehabilitation Program, among others. "It would be extremely challenging for DOTE to address all of the requests that have been received, given the restraints of our capital budget," Vogel wrote. Mackenzie Farmer Low, of Pleasant Ridge, lives in a neighborhood that has had some pedestrian safety requests come through, but not all. As a member of the pedestrian safety group Pleasant Streets, she has witnessed the funding struggles DOTE faces. "It seems like a cry for help from the DOTE and the new director," she said. "He's hearing what residents want, but he doesn't have the funding to work on it." Initial attempts to pump resources back toward traffic enforcement and the police department's Traffic Unit also have proved underwhelming. In a concurrent memo from Isaac to Duhaney, the police chief said: "(E)arly indications suggest current increased enforcement efforts have not yielded the desired results in terms reducing serious injury and fatal crashes." City data show that pedestrian-involved crashes have increased steadily since 2013. Those efforts included a two-week targeted traffic enforcement blitz in October, which resulted in nearly 800 citations -- including more than 600 speeding citations. After Nov. 1, the department continued ongoing enforcement efforts, yielding another 458 speeding citations through the end of the year. That made for nearly 1,100 speeding citations in the last 10 weeks of 2018. Isaac called the increased enforcement efforts "manpower-heavy" and said they have returned "less-than-ideal results." "The manpower-heavy approach to combating traffic issues hinders CPD's ability to utilize officers in other vital public safety initiatives," Isaac wrote. One solution could be adopting new technology to assist in traffic enforcement, Isaac said, including hand-held speed citation cameras, tech that the police chief called "promising." The cameras would enable officers to issue citations using video footage captured with the camera, and it would bypass the traditional traffic stop exchange involved in issuing traffic citations. "(A)dopting such a technology would require a change to the city charter," Isaac wrote. City Councilman Greg Landsman requested a report on technological enforcement tools, such as speed cameras, in a Jan. 7 motion calling for the comprehensive review of the city's pedestrian safety efforts. The DOTE memo also outlined roughly $900,000 in additional pedestrian safety projects proposed last week by Mayor John Cranley. Ultimately, Vogel said increasing future funding levels for pedestrian infrastructure and increased enforcement would be a challenge: "Attempting to add additional funding to the program is one possible solution for moving forward; however, as mentioned previously, given the current strain on the city's capital budget it may be time to consider other options, including the use of technology." Funding is an issue that expands throughout DOTE's full range of tasks and responsibilities. In a memo last fall, Duhaney said it would cost roughly $1 billion to bring all of the city-maintained roads and bridges back up to "good" condition.